Benfica, Porto, Sporting, these are Portugal's “Big Three”, this is how they have always been seen both inside the country and abroad. According to Belenenses though, Portugal's “big” are four, despite the fact that there is a chaotic difference in the number of titles they and each of the “Big Three” have won. In any case, Os Azuis do Restelo (The Blues from Restelo) are definitely one of Portugal's most historic clubs, and one of only five to have won the Championship. 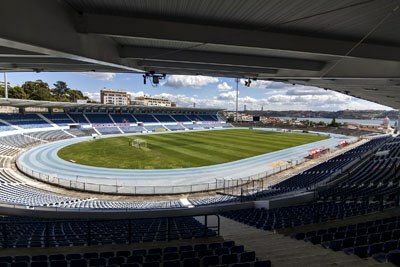 Estádio do Restelo, the home of Belenenses since 1956, with its gorgeous view over Tagus (Tejo in Portuguese) River. Clube de Futebol Os Belenenses were founded in 1919 in Belém, a riverside district of Lisbon (hence the name, “Belenenses”, “the ones from Belém”). The club faced enormous financial problems their first weeks/months, to the point of fearing that they wouldn't last for more than half a year. Almost a century later, they are still around, having risen to Portugal's top five. In fact, there was a time when Belenenses were rightfully considered one of the “Big Four”. Back in the 20s and the 30s, before Portugal got its national Championship and the so-called Taça de Portugal, its Cup competition, the “Campeonato de Portugal” was were the country's biggest teams met. Similar to today's Taça de Portugal (despite containing the word “championship” in its title), the competition had its inaugural season in 1922. In the next 15 years, Belenenses won as many titles as Sporting (three), one less than Benfica and Porto, reaching the final three more times, without though lifting the trophy. Belenenses remained equally successful in the 40s, winning the recently-established Taça de Portugal in 1942, reaching the final on three more occasions, and, most of all, winning their first Championship title in 1946, first and last until now. The fact that a year later, in December 1947, Real Madrid invited no other but Belenenses to inaugurate their newly-built Nuevo Estadio Chamartín, the one we all know today as Estadio Santiago Bernabéu, speaks volumes of how highly-regarded the club were in their heyday. In 1960 they added another Taça de Portugal to their modest collection of trophies. Failing to finish higher than second in the Championship, the team reached their lowest point in 1982, when they got relegated for the first time in their history. After two seasons in the second category, Belenenses not just returned among the country's top teams, but they also reminded everyone a bit of their golden days, reaching the Cup final in 1986, winning the trophy in 1989, and Potugal's Super Cup soon after that, their last title ever since. Belenenses are much more than football, they have various sectors, almost all winning titles on a regular basis, but “futebol” is by far the most popular sport in Portugal. Vítor Godinho spent the biggest part of his career at Belenenses, from 1962 to 1977, having 272 appearances in the Championship alone. He has worn the team's jersey way more times than anyone else. If reliable data could be found, he should have the title of the club's top scorer as well. What is for sure is that Miguel Rosa, a member of today's team, has scored a total of 41 goals both in the Championship and the Cup, a number he is sure to further improve, since he is only 28, possibly at the best point of his career. Belenenses have always been a club producing talents, Eliseu, member of the Portugal team that won Euro 2016 in France is an example (that's where he started his professional career), but they've always found it impossible to hold on to their most promising players, especially scorers, therefore no one ever reached the numbers (over 100 goals) seen in other clubs. Belenenses don't have a super modern, huge, and futuristic stadium like Benfica or Sporting, but few -if any – venues in Lisbon and the whole of Portugal can match the views offered to visitors at Estádio do Restelo. Opened in 1956, the stadium is located no more than 800 meters north of Tagus River, slightly up on a hill. The fact that its southern end has no stands, means that fans can enjoy views over the river, a “bonus” that the spectacular stadiums of the city's other big teams are lacking. The “escudo” of Belenenses has remained practically unchanged for a century now. Minor details like the color of the “CFB” initials and the frame surrounding the crest have changed, it also used to be kind of more round, but nothing more than that. The “Cruz da Ordem de Cristo”, the “Order of Christ Cross”, a symbol linked with Portugal like possibly no other, has always been at the very center of the club's crest.